Plants microscopic, parasitic on Polysiphonia incompta, often causing deformed growth of host. Filamentous, monosiphonous in vegetative parts, branched vegetative axes growing between axial and pericentral cells of host. Trichoblasts only present in female plants, in the form of short hairs at the apex of each branchlet, the apical cell of which bears one or two characteristically claw-like hairs. Fertile axes producing reproductive structures external to host on polysiphonous branches with four pericentral cells. Tetrasporangial axes simple, each segment dividing off four pericentral cells that develop into four rows of tetraspores; tetrasporangia often in stichidia, tetrahedrally divided, each with two cover cells. Male axes usually simple, stalked, forming single antheridial branch but sometimes bi-or polyfurcate.Young female axes with distinctive crab-like appearance, cystocarps one or two, each ca 160 x 220 µm, ostiolate. Only recorded from Cannon Rock to Three Sisters (Pocock 1956) in the Eastern Cape (38-39), but probably more widespread. Only found as a parasite of Polysiphonia incompta. World distribution: South African endemic. Type locality: Port Alfred (The Kowie), beyond Salt Vlei, South Africa, parasitic on Polysiphonia incompta (Pocock 1956). 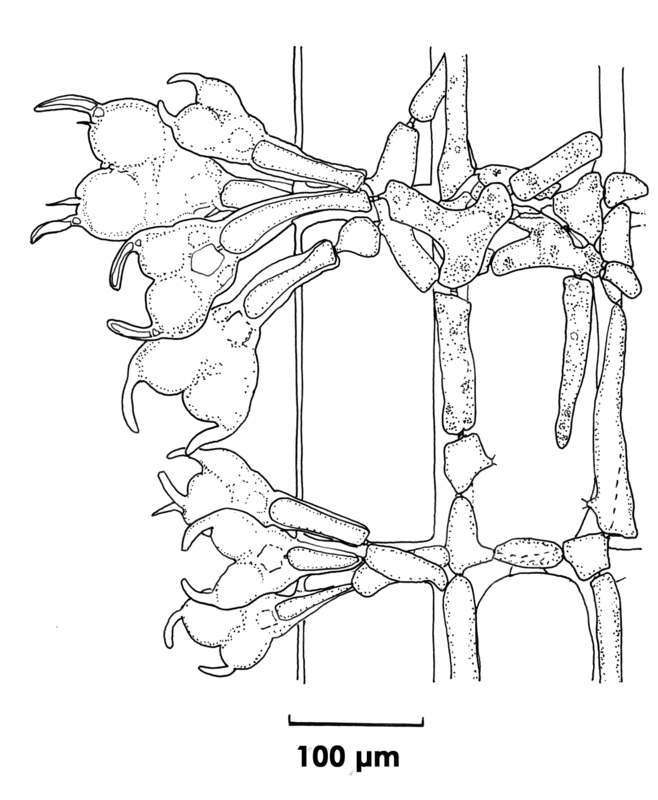 Onychocolax polysiphoniae, filaments of thallus growing between cells of Polysiphonia, with claw-like female reproductive parts emerging from host tissue (re-drawn from Pocock 1956). Pocock, M.A. 1956. South African parasitic Florideae and their hosts. 3. Four minute parasitic Florideae. Proceedings of the Linnean Society of London 167: 11-41, 6 figs, 6 plates. Anderson RJ, Stegenga H, Bolton JJ. 2016. Seaweeds of the South African South Coast. World Wide Web electronic publication, University of Cape Town, http://southafrseaweeds.uct.ac.za; Accessed on 21 April 2019.